Harare International Airport is located southeast of the capital, near the new residential area of Arlington. Access to the city center, about 12 km away, is fast thanks to the Airport Road. Car parks, taxis, shuttles and limousines offer travelers the choice of their means of transport to the airport. Several car parks are located around the terminal of Harare Airport. Depending on the expected duration of parking, you will choose the most appropriate. Reservations are recommended for long stay parking. Additional hours charged after first hour $US 2/hour. Taxis are available 24 hours a day at Harare International Airport. Price must be negotiated with the driver before entering the vehicle. 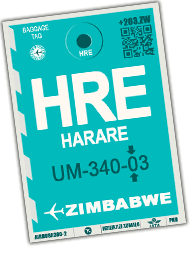 Harare being an extended city, the fare and the duration depend therefore on the destination and on the road traffic. It usually takes less than 30 minutes to drive between the airport and most neighborhood of Harare including the city center. The average fare is $US 25. Several car rental companies offer their services in Zimbabwe. Some of them have an office in Harare International airport where to pick-up your car 24h a day and others provide you with the car on your arrival.